What are personal guarantees and how are they effective in collecting commercial debt? We absolutely love clients who obtain personal guarantees! Why? Because their accounts are twice as collectible as other clients who do not use personal guarantees. If you are dealing with a corporation or a Limited Liability Corporation (LLC), your claim is solely against the corporation and not the principal/owner of the corporation. If the debtor corporation goes out of business, you cannot proceed personally against the owner unless, of course, you have a signed personal guaranty whereby they agree to personally pay the debt in the event that their business does not. We are then allowed to proceed against the guarantor(s) personal assets to enforce the collection of the past-due account. Over the years, we have filed many a lawsuit where personal guarantees were signed. There have been a few instances where the courts have actually ruled that the guaranty was not valid because the owner signed his corporate title after his signature such as “John Doe, President”. The debtor’s attorney argued that because he signed his title, he was signing in a corporate capacity and not really signing it personally. 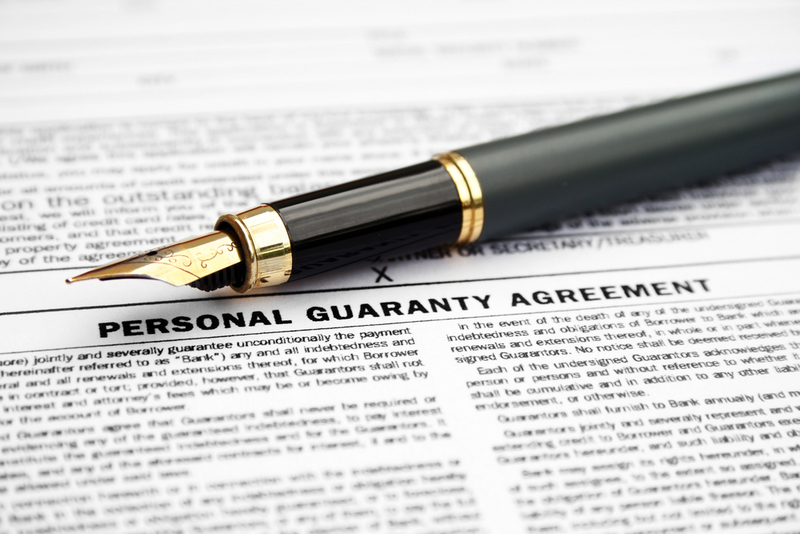 If you do use personal guarantees, do not put a section on the guaranty for them to sign their title. Make sure you know who is signing the personal guaranty. A scribbled signature that is illegible is difficult to prove it belongs to a particular person. Be sure to have a section for them to actually print their name, and a separate section for their actual signature. Also, the guaranty should ask for a Social Security number and/or at least a home address for the guarantor. This further substantiates the fact that they know they are signing the agreement in a personal capacity. This also provides you with information on the guarantor so you can locate them if their company does go under. We have had a few circumstances where the client has a personal guaranty, but it was signed with a rather common name such as “John Smith”, and the client did not get any other personal information and could not determine which “John Smith” (out of the thousands in that particular town) was the correct one. If you have a personal guaranty incorporated into a contract or a credit application, be sure to have a separate signature section for just the personal guaranty. If you try and hide it in a document in the hopes that they will sign the agreement and not notice the guaranty, a good attorney will likely get it thrown out. Many companies prefer not to request personal guarantees as they believe that their customers will not want to sign them and will simply go to another vendor who does not require them. This may or may not be true and it is certainly your decision. If you decide not to request them, understand that your accounts are going to be infinitely harder to collect and maybe impossible to collect if the debtor corporation simply goes out of business. Personal guarantees are wonderful and extremely effective. I certainly wish more companies would require them and that they would become more common in the commercial collection industry. The only ones who would not be happy with this would (of course) be the debtors. If you have any questions relating to personal guarantees and how they can help on your commercial collection accounts, just let us know!